Often, when we talk at Still Water about the elements that helps us to be mindful, practitioners mention being calm and rested and in a natural space such as the the seaside, the mountains, or a garden. When these elements are present, it is easy to be mindful, and our mindfulness is pleasant and nourishing. However, we are not always calm, rested, and in a beautiful natural space. Sometimes our whole being seems dominated by unpleasant mindstates, such as tension, sadness, agitation, self-condemnation, or despair. What then? Anyone who knows the practice of mindfulness knows that we have to go home to the present moment. When we go home to the present moment you find two kinds of situations. The first kind of situation is that there are so many conditions of happiness available in the here and the now. When you breath in and bring your mind home to your body, you are establishing yourself in the present moment. And you notice there are so many refreshing and healing elements available in the present moment. There are also many conditions of happiness available in the present moment. With that awareness, to generate a feeling of joy and happiness is very easy. You can nourish yourself with joy and happiness. That is the first thing you encounter when you go back to the present moment. The second situation is that when you go back to the present moment you may encounter a feeling of pain, a painful emotion that is in you. In fact, a painful feeling, a painful emotion, manifests from time to time. But when it begins to manifest, we don’t like to be there, so we try to run away, pretending that it is not there. So no one is there to take care of the painful feeling, the painful emotion. So going back to the present moment here is no longer to recognize the elements of joy and happiness, but to have a chance to take care of the pain in ourselves and to transform it. So even if the present moment is unbearable, to go back to that moment is the only chance for us to do something in order to calm it down and to transform it. Most people don’t do that because they are afraid that when they come home to themselves and touch the pain the pain inside, they will be overwhelmed by the suffering. That is why their practice is to run away. Imagine something about the future to future, to forget. Go back to the past, to forget. But the past and the future they are like images, not reality. Only the present moment is real. Many people try to cover up the pain inside, not only by going back to the past or running to the future, to imagine there will be some hope, some end of suffering in the future. But that cannot last long. Most people try to cover up the suffering inside by the practice of consumption. We read magazines. We watch television. We find something to eat. We listen to the music. We pick up the phone to talk. Everything we do, we do because we hope hope that by doing these things, we don’t have to confront the suffering in us. And we allow that pain to continue to grow in us. So the practice of mindfulness helps us to go home to the present moment. Even if the moment is not pleasant. But it is in that very moment that we can understand the suffering and that we can find a way to calm it down and to transform it. So next time, you find the moment not pleasant, don’t think that running away from it is the best way. 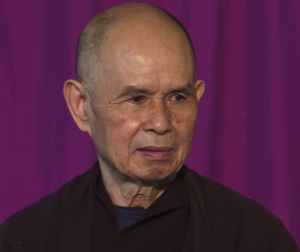 This Thursday evening after our meditation period we will watch a twelve minute video of Thay answering the question. You are invited to join us. You are also invited to watch the video on your own. It is available at https://www.youtube.com/watch?v=t5Ka2RS0UC4. One of the methods Thay uses to take care of his strong emotions is belly breathing, which he writes about in the excerpt below. A simple method for taking care of strong emotions is belly breathing, mindful breathing from the abdomen. When we are caught in a strong emotion, such as fear or anger, we should bring our attention down to our abdomen. At times like this, to remain at the level of the intellect is dangerous. Strong emotions are like a storm, and it is not wise to stand in the open during a storm. Yet our normal reaction is to stay in our head and let our feelings overwhelm us. Instead, we should get rooted in our breathing, focusing on the rise and fall of our abdomen, bringing our attention down to our center. When we focus on our belly and practice mindful breathing, we give all of our attention to its rise and fall. We can do this sitting or lying down. Putting a hot water bottle on the belly is also helpful. We feel the warmth of the hot water bottle and we can easily bring our gentle awareness to our stable center, allowing us to calm down. One night, when I was in pain and could not sleep, I brought to mind the image of three cedar trees at my hermitage. With my mindful breathing, I embraced these beautiful, strong trees. I felt their freshness and stability penetrate me and I was able to overcome my painful feeling. When you look at a tree in a windstorm, you see that the top of the tree is unstable and vulnerable. The wind can break the smaller branches at any time. But when you look down at the trunk of the tree, what you see is very different. The tree there is solid and will withstand the storm. We are like a tree. When we are upset, our head is the top of the tree being whipped around during a tempest, then we have to bring our attention down to the level of our solid trunk, our navel.